"Labor shortage is a huge problem in agriculture," said ECE ILLINOIS affiliate faculty member Girish Chowdhary, assistant professor of Agricultural and Biological Engineering and principal investigator on the project. "Today’s large farm equipment enables a specific type of agriculture, a monoculture of soybeans or corn. We had this idea to use soft-armed robots to assist with the most labor-intensive crops." "The behavior of conventional robots is very accurate and precise, but soft robots exhibit adaptable and dexterous behavior," said Girish Krishnan, assistant professor of Industrial and Enterprise Systems Engineering, whose expertise is in nontraditional, soft robotics. "When (we’re) talking about berry harvesting, each berry shrub is different, and thus different strategies may be needed to reach intricate positions. Soft robots are inherently adaptable to these variations and can be a game changer in the agriculture industry." 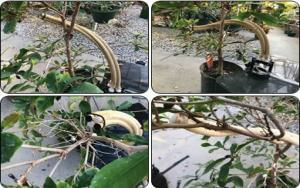 A prototype for the soft arms of the robot shows its dexterity to bend around plants. "The biggest problem is control," said Chowdhary, who is also affiliated with the Departments of Computer Science and Aerospace Engineering as well as the Coordinated Science Lab. "Traditional control methods don’t work for soft robots because of their soft and compliant nature." Predicting how the robots will achieve their tasks and interact together is the job of Mattia Gazzola, the team’s computational modeling expert. Whereas traditional robots are normally tested through trial and error, that wouldn’t be an ideal approach when a robot is dealing with valuable growing plants. Unlike hard-bodied robots, soft robots have the additional challenge of body fluidity; when one part of the robot moves, it may affect another pagudert. "One of the challenges is to acquire data to determine how we should activate the robots and get them to move in the field," said Gazzola, assistant professor in Mechanical Science and Engineering. "The goal is to do all of this in the computer. This way we can enhance the capabilities of these robots and develop them faster." The purple strands on the left show the simulated robot arms. The red and creme strands on the right show the actual robot arms created for this project. "I think field testing will help overcome the challenges we’ll face when developing the robots," said Lovell, an associate professor in Crop Sciences. "We’ll learn a lot every time we take the robots into the field and see how they are working. It will be an iterative process in that way."